This gang started on the West Side of Los Angeles around 1965. It was originally made up largely of 2nd generation Hispanic immigrants. As the 18th Street gang began to battle with more established Chicano gangs, they began to recruit outside of the Hispanic community. Some officials currently estimate their size with up to 20,000 members in over 120 U.S. cities. According to the Department of Justice, recent estimates are 60% were now "illegal immigrants". The gang became so big, many of its members did not even recognize each other! They started up their own websites to improve communications. Many times 18's will wear grey and black "Raiders" colors, or they may wear blue for Sur. They may have tattoos of 18th Street, XV3, XVIII, 666 (which equals 18), Diesiocho, or spell out Eighteenth Street. They are active in many parts of Washington State, as well as Portland and Salem, Oregon, as well as Idaho. In July of 2000, there was an federal RICO indictment by L.A. prosecutors against (26) 18th Street gang members who were accused of major drug trafficking in and around the MacArthur Park area in the Pico-Union district just west of downtown Los Angeles. The Columbia Li'l Cycos are one of the most violent and financially successful 18th Street cliques in L.A. A senior FBI official in Los Angeles, said Columbia Li'l Cycos, also known as CLCs, "were held up in the gang community as examples of how to do business." Federal investigators seized approximately a half million dollars in cash from gang members' hangouts. "This wealth was accumulated one [cocaine] rock at a time," said another official. 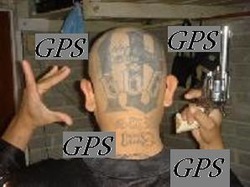 In 2006, an alleged former 18th Street gang member Hector Marroquin was accused of being involved in Mexican Mafia criminal activity during the same time he was running a well funded anti-gang program called "NO GUNS" with his son Hector Jr. In January, 2008, Hector Sr. was sentenced to eight years in prison. Hector Jr. was convicted for his earlier role in a home invasion robbery. This case shows how gangs often infiltrate "Gang Intervention" programs!